Item number DS410 - Capricornus - Image © Digital Sky LLC. 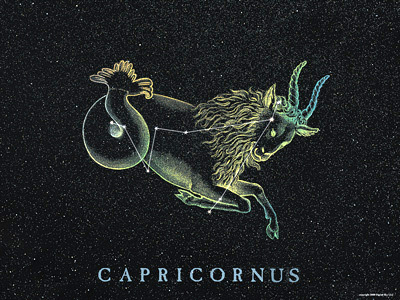 Capricornus is one of the most mysterious and ancient of all constellations. While it is mostly identified as half goat and half fish, it's origins are confused. The story goes that the excitable Pan jumped into the river Nile to escape the monster Typhon. Pan tried to transform himself into an animal to hide and the part above water became a goat and the part below water became a fish.